Some of the well-entrenched companies operating in the India water purifier market are Pentair Residential Filtration, Tata Chemicals Ltd., LLC (EVERPURE), and GE Corporation (Water). Upcoming players, namely Eureka Forbes, Kent RO Systems Ltd., Aquasana, Inc., and Aquatech International have upped the ante against the existing big names, thereby making the competition stiff in the market. Some of the popular strategies leveraged by savvy players are continued focus on product development and carefully-considered partnerships to bolster their geographical footprints. GE Corporation, for example, resorts to diversification and has accomplished over US$100 billion worth of acquisitions and dispositions to stay ahead of the curve. Eureka Forbes’ tries to rope in customers through the use of campaigns educating consumers. Kent RO Systems Ltd. expends a lot of energy on product development and product innovation and also deploys other strategies to increase its customer base. A research report by Transparency Market International predicts the water purifier market in India to rise at a stellar CAGR of 15.4% from 2016 to 2024 to reach a valuation of US$4.1 bn in 2024 from US$1.1 bn in 2015. Sediment purifier, gravity purifier, reverse osmosis (RO) purifier, water softener, and UV purifier are to name a few of the popular technologies deployed in the water purifier market in India. Among them, the RO and UV purifying technologies are slated to grow at a healthy clip as they can purify the water to a great extent. 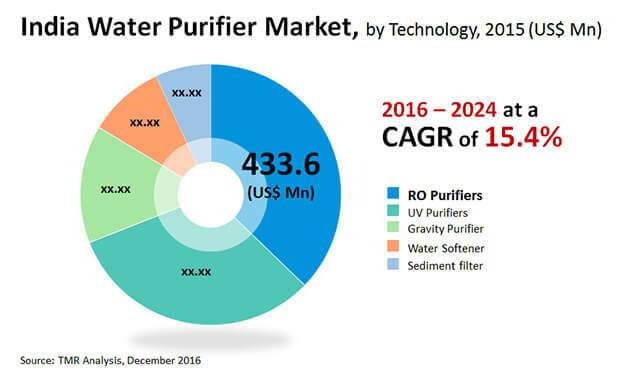 In fact, the RO purifier technology segment is expected to rise at an eye-popping CAGR of 18.2% during 2016 and 2024. The commercial and household segments will likely lead the water purifier market in India with robust take-up of the different technologies. From 2016 to 2024, the household segment is forecasted to clock a robust CAGR of 15.5%. The rising demand for affordable and portable water in Indian households is predicted to play an important role in shaping the future of India water purifier market. Further, commercial water purifier technologies and solutions will see a major fillip in demand because of numerous cafés, small shops, and public places in India trying to comply with government initiatives of providing purified water across the country. At the forefront of driving demand in the water purifier market in India is the rising concern about harmful impurities and pathogens present in water provided to households and other sectors. This has led to the need for portable water to thwart water-borne maladies. “Several government initiatives to ensure safety of citizens is also focused at raising awareness about water purity, which has been augmenting the demand for these technologies. These efforts have been especially pronounced in rural areas of India,” explains the lead analyst of the TMR report. Besides, ramping up of digital marketing methods and increasing number of physical stores purveying water purifiers is also predicted to stoke healthy growth in the market. In spite of awareness programs undertaken to educate the masses, a sizeable proportion of people in India have no knowledge about the importance of water purification. This along with the lack of means to invest in the systems has crimped the growth in the water purifier market in India. In fact, a substantial number of people still rely on traditional methods for purifying water such as boiling. Further, varying water textures in different regions of the country pose a challenge to companies as they need to come up with purification technologies that cater to region-specific water types.